Grand Theft Auto Online, known by most folks outside Rockstar as GTA Online, presents up to 16 players with a dynamic and persistent online world that will allow the Grant Theft Auto experience to evolve well after the game launches. That’s all well and good, but Rockstar Games today said three words together that gamers will like to hear even more: GTA online free. That’s right: everyone who purchases GTA 5 will get GTA Online free. It was not clear whether getting GTA Online free via your GTA 5 purchase is the only way to get the game, or whether a paid version will also be available. GTA Online shares gameplay features, geography and mechanics with GTA 5, but it will expand and evolve after its launch with new content created by Rockstar Games and the GTA community. GTA Online takes the fundamental concepts of freedom, ambient activity and mission-based gameplay and makes them available to multiple players in a detailed and responsive online world. With GTA Online free, anyone who purchases GTA 5 will have the freedom to explore the Online world alone or with friends, work cooperatively to complete missions, band together to participate in activities and ambient events, or compete in traditional game modes with the entire community, all with the personality and refined mechanics of GTA 5. 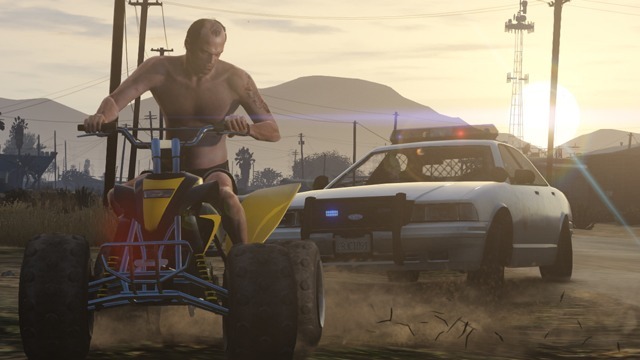 Players can invest in their GTA Online character through customizing their appearance, improving their stats, owning customized vehicles, purchasing personal property, and taking part in missions, jobs and activities to earn reputation and cash to open up new opportunities to rise through the criminal ranks. GTA Online will constantly grow and change as new content is added, creating the first ever persistent and dynamic Grand Theft Auto game world.